This is an exciting opportunity to learn about what a true Southern California lawn is – a native turf that needs minimal water! 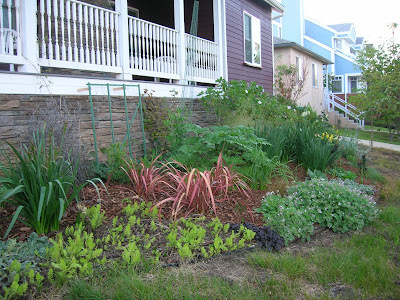 This is a plant collectors garden with a drought tolerant parkway, a California native lawn of Carex praegracilis, and a mixed perennial bed in the front yard. Ryan Guillou, Grow Native Nursery's Propagator and Assistant Manager, will be on hand to answer questions about the garden. Take this opportunity learn how to introduce California native plants into your traditional Landscape from an expert! And learn more about this wonderful nursery carrying native plants and expertise in our own back yard! The entire garden receives no water during the rainy season. During the dry months the parkway is spot watered once every three weeks, allowing most of the plants to go through their summer dormancy. The Carex lawn is currently watered once a week in the summer in order for it to establish. Once it has a firm hold in the garden it will only receive supplemental summer water once or twice a month to keep it green, none if they decide to let it go completely summer dormant. The perennial bed receives water once every two weeks in the summer months, with some additional water if temperatures are high. The inspiration for this garden comes from an appreciation and understanding of the seasonal nature of California’s Mediterranean climate, and the concept of “right plant for the right place.” Many of the plants in this garden are not considered drought tolerant, but they are sited and established in such a way that they require remarkably less water. Something to consider when viewing this plant collector’s garden, is that the garden is ever-changing. Plants are removed, moved, and introduced on the whim of the owner to make room for more unusual, rare, or simply loved plant specimens. Many of the plants were obtained from botanic gardens and various rare plant nurseries. The garden was started 6 years ago, and was originally planted to mimic a classic English garden. Needless to say, it was not a success and 95% of that plant material was removed. Since then, this plant collector’s garden can be viewed as an informal trial garden of sorts. Plants are obtained, bought and planted either by necessity to fill a space, or on a whim. The garden has changed drastically over the years to appreciate a Southern Californian climate and the amount of diversity it allows in the plant material used. More plants died in the development of this garden than ever survived…..a sort of morbid trial and error. Only sweat, a little blood, and hand tools are used in this garden.